You know how many times we’ve heard that women with curly hair can’t wear a bun? Many times! It’s true that curly hair requires a little more attention than straight hair because of the quantity and texture, but it doesn’t mean that certain hairdos are off limit. Very few products understand that hair is a living thing with a mind of its own that sometimes behaves well and sometimes is a rebel. Dove recently launched the #LoveYourCurls campaign to empower women to embrace their curls and we learned how to make the perfect bun. Follow these simple steps and you can make one too! 1. 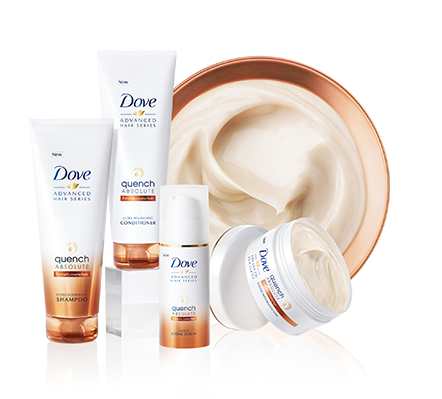 After the washing process, apply 2 to 3 pumps of the new Dove Quench Absolute Supreme Crème Serum, use more or less depending on the texture and length of your curls. Dry your hair using a diffuser on medium. 2. With the wide tooth comb direct all the hair up and grab it with a hair tie to create a high ponytail. TIP: If you have lots of hair, use a hair tie with a hook at the ends. This will allow you to gather and hold all of your hair. 3. Divide the ponytail in two and turn each section to create two thick twists. 4. Roll one of the twists around the base of the ponytail and secure with pins. Then, take the other section and roll around the base of the ponytail, but in the opposite direction, and secure with the bobby pins. 5. Once the bun in completed, you can mess it up a bit so that your curls give it a special and modern touch to the look. 6. Apply hair spray to hold the look and use the bottom of the comb to control any loose hairs. ¡Deja de plancharte el cabello mal!